It has been said that magical girl shows contain valuable life lessons. 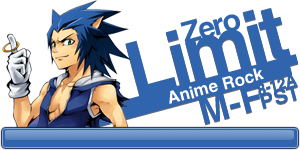 This concept was reinforced with added segments like “Sailor Moon Says” in the North American airing of the series. And while I doubt Cutie Honey offers much aside from entertainment value, messages can still crop up in the most surprising places. Though Puella Magi Madoka Magica is a deconstruction of a magical girl genre, each character comes bundled with important lessons for its adult audience. 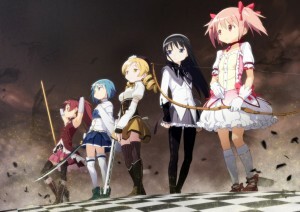 From left to right: Homura, Madoka, Sayaka and Mami. Madoka – Faced with the most important decision of her life – in this case, her own self-worth versus the worth of those around her – she waivers consistently. 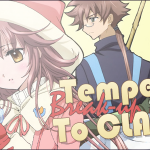 She makes herself helpless in the situation as she fights to decide on whether or not to become a magical girl. And while waiting was not the preferred method, the time allowed her to consider every avenue as well as every possibility. She found out more information about what it means to be a magical girl and she discovered every detail of unmentioned fine print that put her ahead of the game. Because she took her time to think through all the possibilities and all of the results, she found a way to save everyone around her. While we are faced with important decisions, like signing apartment leases or choosing a major, it is important to consider the benefits as well as the disadvantages. Homura – She devoted herself wholeheartedly to a cause and spent years of her life seeking a better ending for the person she cared most about. In this final timeline, she discovered her efforts were not in vain, but the goal she had in mind was not a possibility. 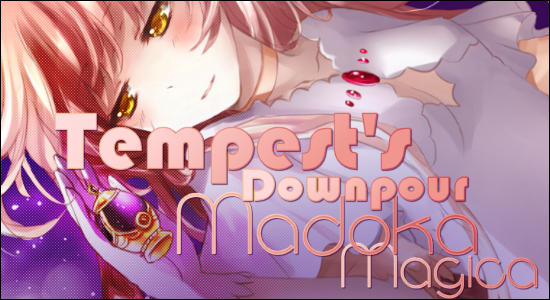 Her intense efforts were rewarded in an ending that saved the world and made Madoka happy, which was ultimately the cause she had been fighting for. 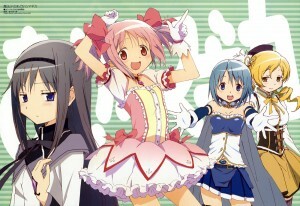 But her mindset, “Madoka must not become a magical girl,” was never to be reached. Devoting herself to a cause meant that she worked towards the ultimate reward (happiness), but the goal did not remain the same. In life, when we care about something passionately enough to try to change the world, oftentimes the goal we have in mind will change. We must be open to this change or we won’t see our own accomplishments. Sayaka – She chose the route of selflessness by selling her life for the chance for a boy to play the violin again. However, she was forced to realize that her motivations were selfish – love and the desire to be loved. When her desires were not returned, she began to lose hope and spiraled into madness and despair. If, from the beginning, she had come to terms with her reason for fighting, she would have been more aware of the consequences. Even the most selfless desires have a selfish motivation. As long as you don’t lose touch with your personal reason, you can devote yourself with fewer regrets. 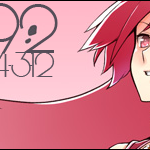 Kyoko – She represents the other side of Sayaka’s coin. Because she is displeased with the result of her “selfless” wish, she devotes her life to only herself. This results in a lonely existence with no purpose. When she finally met Sayaka and saw in her the same mistakes, she found new reason to fight and ultimately a way to bring slight happiness to a lost soul. Devoting your life to only yourself is a lonely existence and can leave you wanting. Be aware of your reason for fighting, but make sure you involve others in the battle. 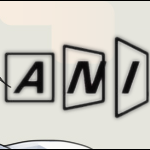 Mami – She was always cautious and level-headed (ohhhhhhh). But the idea of sharing a bond with another person made her cocky and overconfident. She lost her head in more ways than one. Remain as cautious on your hundredth day of work as you were on your first. Overconfidence will always result in life smacking you in the face. Avoid repeating this lesson as often as possible. 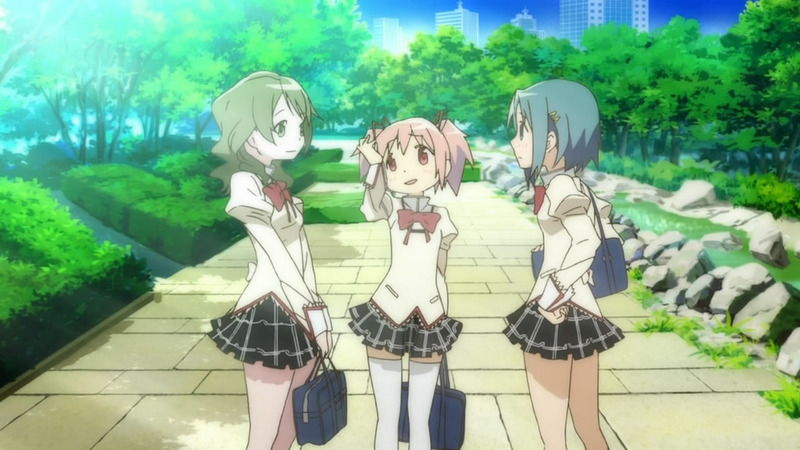 Hitomi (on the left) speaking to Madoka and Sayaka. Madoka’s mom and dad – While this is far from shocking in today’s world, Junko is the working mom and Tomohisa is the homemaker/dad. Madoka asks about if her mom enjoys working and Tomohisa explains that both he and Junko are being fulfilled in their own ways. Don’t let society tell you how to live your life. Follow your personal motivations and find people who will support you rather than change you. Hitomi – Love her or hate her, Hitomi was forthright about her feelings for Kyosuke. She told Sayaka and even offered to give Sayaka a day to confess her feelings to Kyosuke first. Hitomi considered Sayaka’s feelings, but put pressure on her: Hitomi didn’t want to wait around while Sayaka wasted time. Hitomi saw her goal and accomplished it in a way Sayaka never could. Don’t back down from your goal. If you feel it might hurt someone, take time out to address the situation with that person. Preparing for battle. 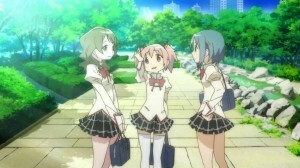 Kyoko is on the far left. Gertrud — Distrusting humans: she prefers the company of flowers. Charlotte – Desire and misgivings: she has an endless supply of candy, but only wants cheese. H.N. Elly – Reclusive and selfish: everything she desires or cherishes goes into her box. Gisela – Stagnant: the machine turns to rust as she does nothing, staring at the sunset. She has her minions make decisions for her and tell her what her opinion is. Elsa Maria — Self-righteousness: she commands others to blindly believe in her. 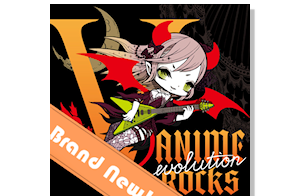 Oktavia von Seckendorff is the fate that befell Sayaka – with her love lost, she searches for that happy feeling in her memories of music. Izabel – Vanity: she wants people to tell her how amazing she thinks she is, though she lacks originality. Patricia – Manipulative: while considered an “onlooker” she pulls the strings to control everyone around her. Roberta — Rage: possibly compounded by alcohol abuse. Kriemhild Gretchen – Of course, Madoka’s witch is scary powerful and her reasoning is justified. Her theme is mercy: she wants to bring everyone to heaven to free the world from misfortune – kind of like what Madoka actually succeeds in doing. If there is no grief in this world, she will believe this world is already a heaven. This was the best article I couldn’t read because I didn’t want to get spoiled on a series I didn’t watch ever!